A little girl in a boxing rack with the Ukrainian and Russian flag. A child with a Russian and Ukrainian flag on his face against the background of the flag of America. hd00:25A child with the flags of Russia and Ukraine on his face against the background of the flag of America shows a fist. hd00:20A little girl in a boxing rack with the Ukrainian and Russian flag. A child with a Russian and Ukrainian flag on his face against the background of the flag of America. 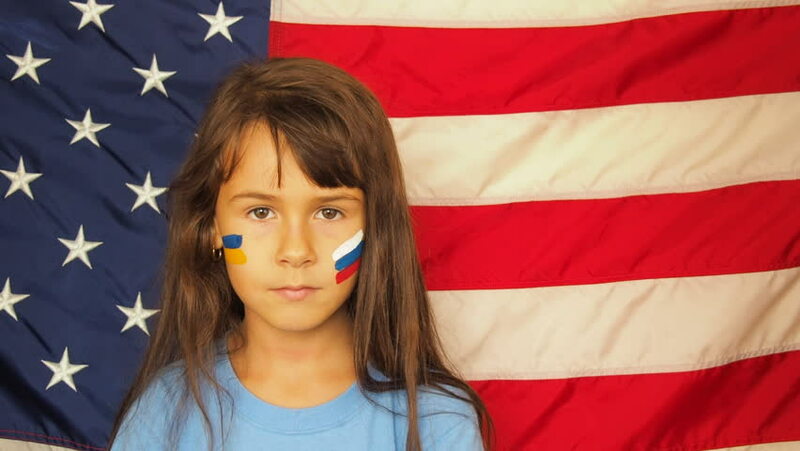 hd00:14A child with a Russian and Ukrainian flag on her face against the background of the flag of America. hd00:20A child with a flag of Russia painted on his face against the background of the American flag. hd00:12Little girl in the crown on a background of the flag of America. hd00:10A child with a painted flag of Russia against the background of the US flag shows a sign of victory. hd00:10Little Princess. A girl with a crown on her head against the background of the flag of America shows a sign of victory.